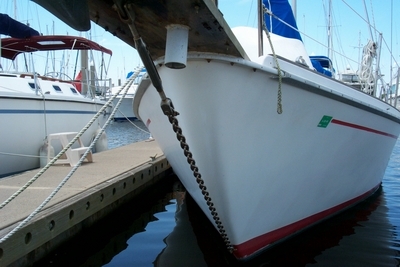 Part of my survey recommendations was to check the area in the bow where the bobstay attaches. Can someone tell me how to do this? 1. slacken the headstay till very loose. 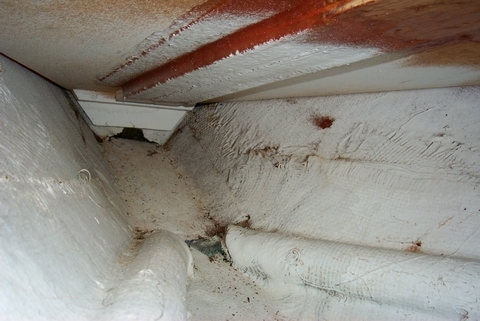 4. after removal, inspect the thread area looking for crevice corrosion. If found a new SS 3l6 rod will have to be procured and of course the replacement is a reverse of above. 5. 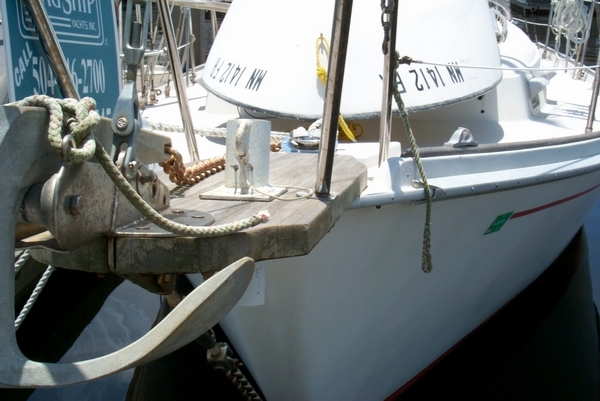 This is a better course than having the bobstay unit explode under heavy sail at sea, pulling the entire teak platform up with the pressure of the sails. We do this every 10 years to prevent any surprises. The higher res version of that photo (1 meg) better shows that there may be access (I dismissed this before ). The point at the bow is entirely glassed in but has a plywood piece that provides support for the veebirth deck or may also be a cover for the chain plate access. This plywood piece has no visible screws or means of removal. In any case this area is only accesible by humans if the veebirth deck were cut away. lumber than would be adviseable. Please offer allternatives, photos. My V berth deck is screwed to cleats that were glassed to the hull sides. I have removed it with a bit of "finding" the screw heads under the paint. It was not a really bad job. The fun was grinding away all of the fiberglass used to install the tank up there. But there is a very distinguishable lump in the area of the bobstay tang. I suspect that the tang could be removed from the inside with a bit of judicious and painstaking grinding, cutting and carving. The old unit should be left intact so that a duplicate can be fabricated from a 316 grade stainless steel,with similar angles. The removal/installation therefore would preserve the exterior gelcoat. Electro-polishing the replacement should be a very necessary step as corrosion is almost a surety for any encapsulated stainless. As I have had to fabricate several replacement "rod" bobstays in the shop in Tortola, I have had the opportunity to see that each one that had failed had done so in the area of the machined threads. This phenomena leads me to believe that the stay should better be served by using either chain or wire as a replacement over rod. My suspicions seem to arrive by the observation that anchor and mooring lines often are exerting side pressure on bobstays. The fittings for chain and wire are apparently more capable of withstanding this force. In this is my observation and opinion but the metallurgy would be far more Jack's bailiwick than my own. A year ago I was motoring down the ICW with a friend steering my SWII. I was below, on the SSB chatting with friends when I heard the engine go into emergency reverse. I ran onto deck as the headstay bounced off a bridge! For some reason my friend thought we could slide under a 20 foot high bridge. The only damage was a small crack in the bobstay fitting, on the fork end that is screwed onto the rod. After thinking about it, as Paul suggests I realized that the bobstay is subject to side loads, so replaced it with 5/16 1x19 wire and two Norseman fittings. The 5/16 matches the strength of the 1/4 headstay given the more acute angle it's on. This arrangement has been very satisfactory. I considered replacing the pin in the bottom Norseman with a big shackle, since this would be a great place to attach the chain snubber, but decided against it because it's so hard to reach down there if something fouled.